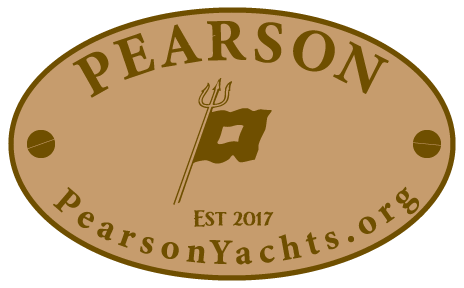 The new Pearson 33 is the third design in our series of contemporary cruisers/racers and reflects a trend towards a preference for performance cruising boats. Its generous rig combined with its modern hull shape gives the Pearson 33 the ability to stand up in a breeze, yet remain responsive in light air. Today’s owners want more speed in cruising boats, and a greater ability to maneuver in tight quarters. The deck layout represents our latest thinking in terms of contoured seating and angled coamings, both of which provide maximum comfort at rest and underway. Her rig is modern, with double swept-back spreaders for improved mast control. Mid-boom sheeting permits use of a dodger or sailing awning when underway, and gives an unobstructed cockpit. A special feature is the continuous reefing system with all halyards led aft. This means you can reef the mainsail without leaving the cockpit- an important safety feature to consider. The interior layout features an enclosed aft cabin for owners /skippers and enclosed V-berths forward for guests, offering maximum privacy. 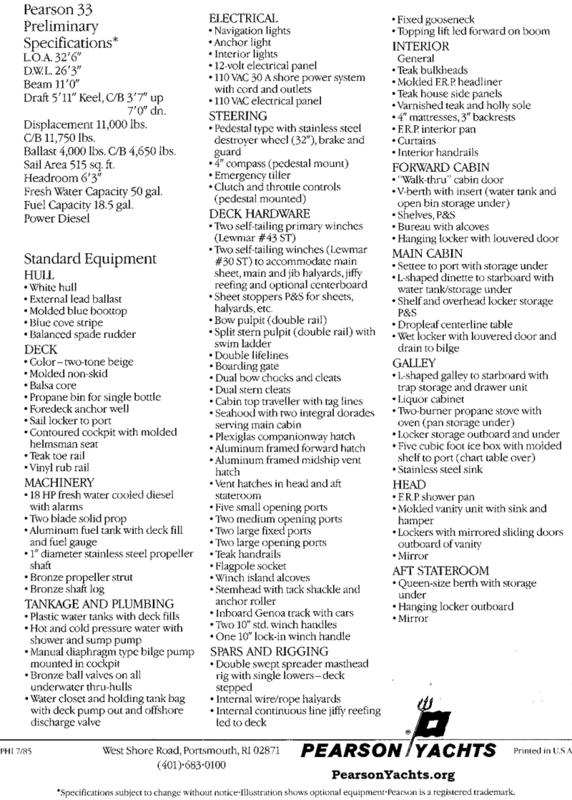 A full head and wet locker are to port of the companionway. The aft location for the head and hanging locker is very accessible from the cockpit. A deep sink and two-burner propane stove are located to starboard of the companionway. The generous-sized icebox with chart table combination is to port. Settees and overhead lockers are on either side, with the L-shaped starboard settee opening to a double berth. A drop-leaf table fits between the settees. Another hanging locker and bureau separate the main salon from the forward V-berth cabin. This layout provides ample headroom and interior space, making the 33 very comfortable. Realizing that many owners need shoal draft, we have given you a choice of keel or keel/centerboard configuration. 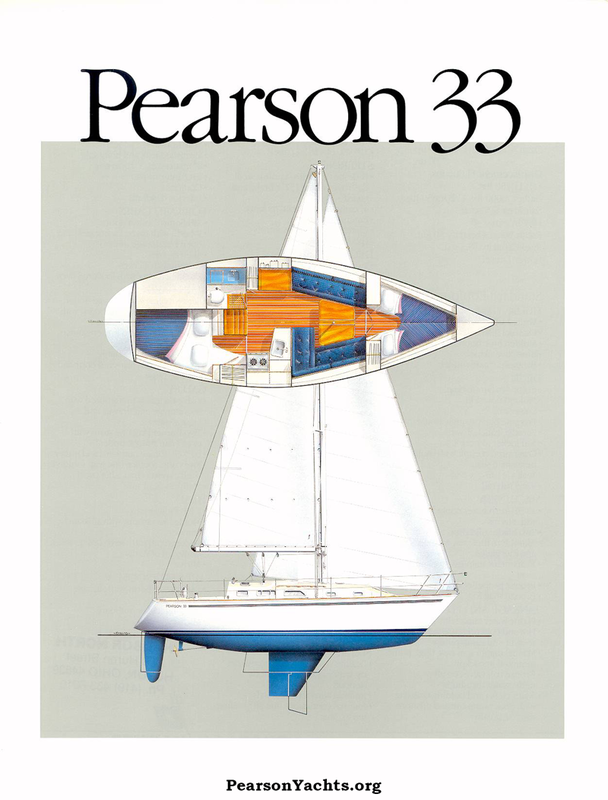 We did not design the new Pearson 33 to any specific rating rule. She’s designed to the rules of nature that we know, from our 30 years of experience, produce fast, seaworthy shapes. 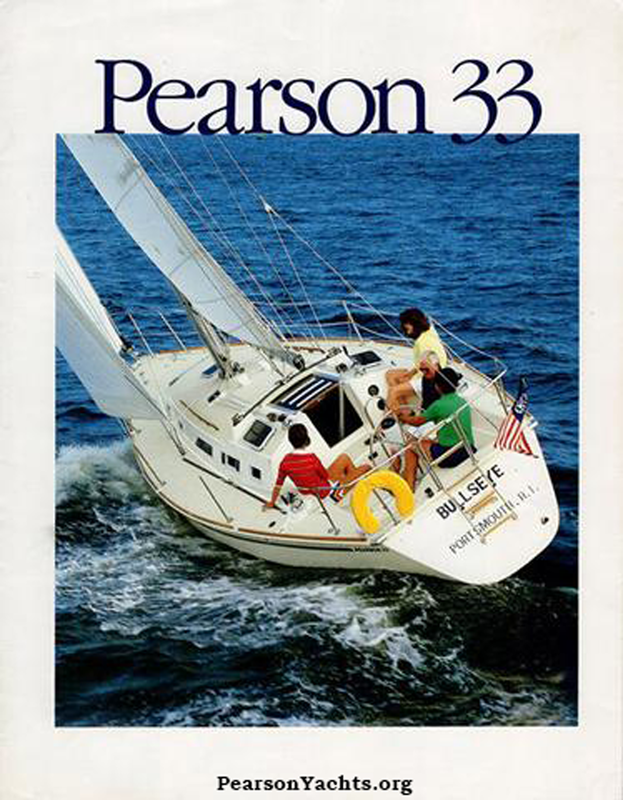 The Pearson 33 will perform favorably under MHS or PHRF rating so she is well suited as a dual-purpose boat for club racing.